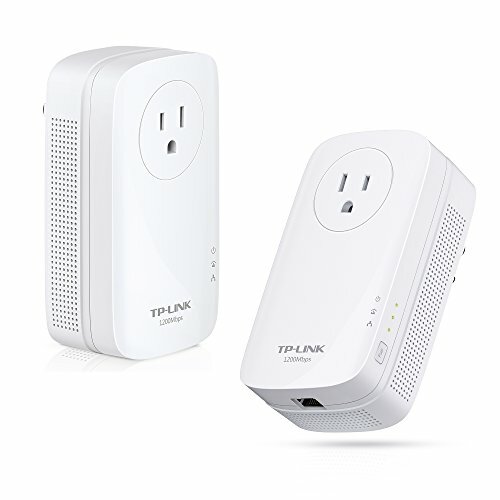 The TL-PA8010P KIT uses your home's existing electrical wiring to expand your network into hard-to-reach areas. The Powerline adapters support 2x2 MIMO, which strengthens coverage and maximizes speed up to 1200Mbps for lag-free gaming and 4K HD streaming. Beamforming optimizes signal quality and boosts overall performance, and each adapter features a Gigabit Ethernet port and a built-in power socket that keeps your outlets free for other uses. The terms “AV1200” and “1200Mbps” are derived from applicable specifications and refer to the theoretical maximum physical-layer data transfer rate. Those terms are used on this product solely to indicate its compatibility with other “AV1200” or “1200Mbps” PowerLine devices. Actual data speeds vary and are limited by the product’s Ethernet port and other network conditions such as data traffic, electrical noise, and wiring issues. If you are uncertain about your network conditions, you should consult an IT professional to assist in selecting a networking product. The theoretical maximum channel data transfer rate is derived from HomePlug AV2 specifications. Actual data transfer rate will vary from network environment including: distance, network traffic, noise on electrical wires, building material and construction, quality of electrical installation and other adverse conditiThe theoretical maximum channel data transfer rate is derived from HomePlug AV2 specifications.